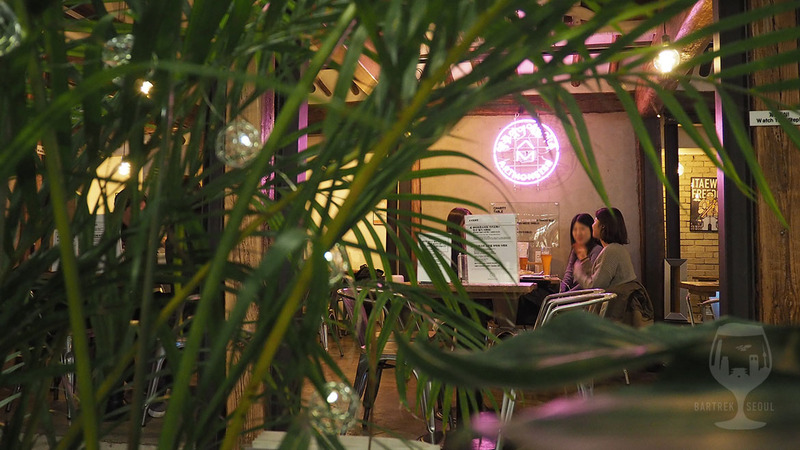 In the Jongno area, between the modern skyscrapers and the historic temples, lie a maze of traditional houses, craft stores, restaurants, old men playing checkers and sleezy motels. Here, in what seems to be the new hot spot for independent art and craft, you can find the treasure that is Art Monster. Not an easy place to get to, but the trip there is extremely scenic, with narrow back-alleys, neon signs and traditional roofs, plenty of young people and even some stray cats. 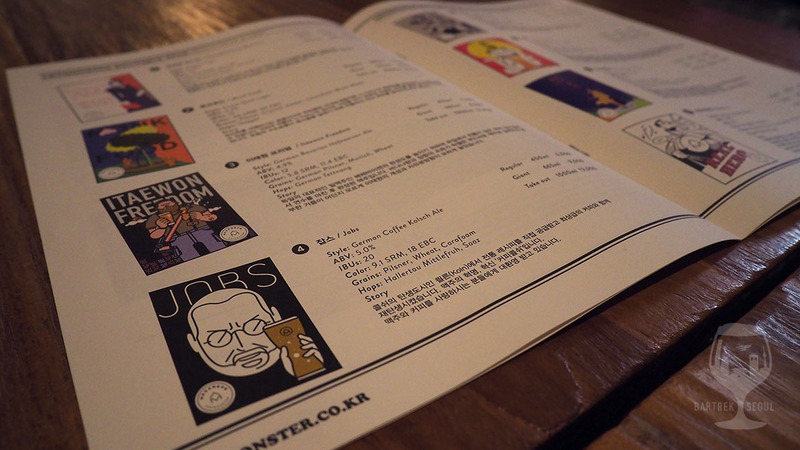 You can only get Art Monster beer here, no imports or bottles, but we really didn’t miss it. 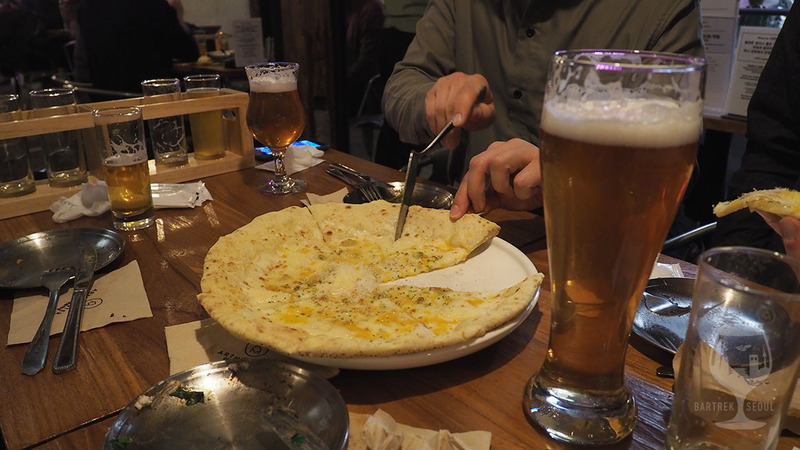 Their selection is one of the most interesting we’ve seen from craft breweries, mostly focusing on German and Belgian styles with uncommon flavors. Unfortunately 4 of their 10 beers were sold out, so we only got to test the remaining 6. With generous tasters, great variety and low prices, the taster set is absolutely the way to go here. 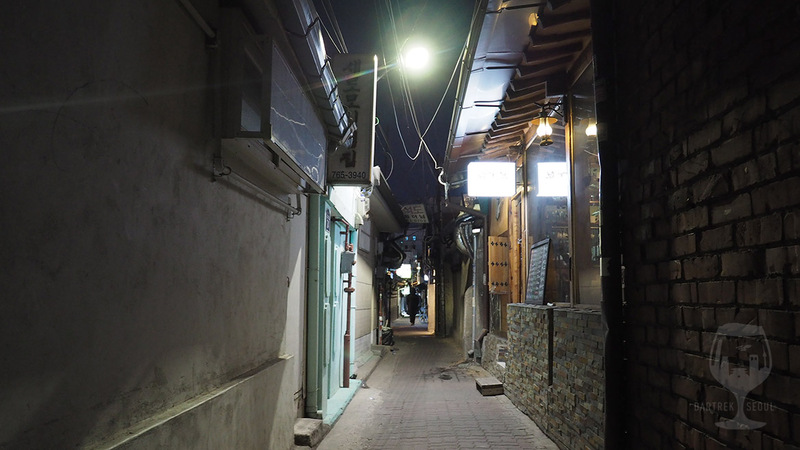 In Ikseon-dong you get to navigate through narrow streets. The entrance of Art Monster tap room on the right. 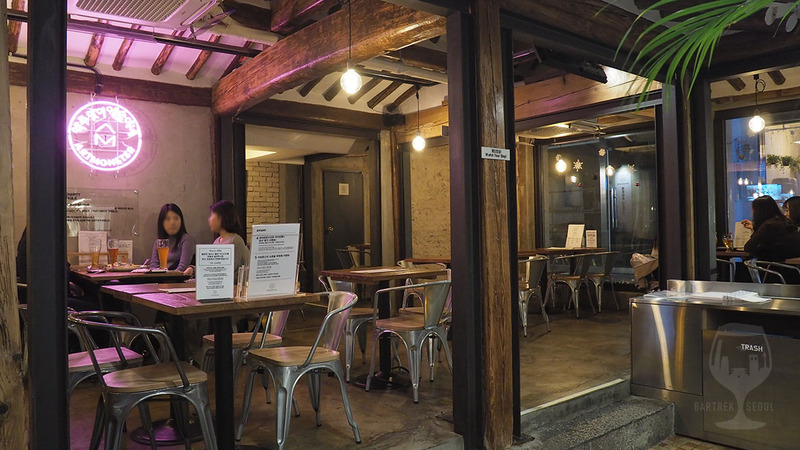 The building is a renovated hanok, a traditional Korean house. 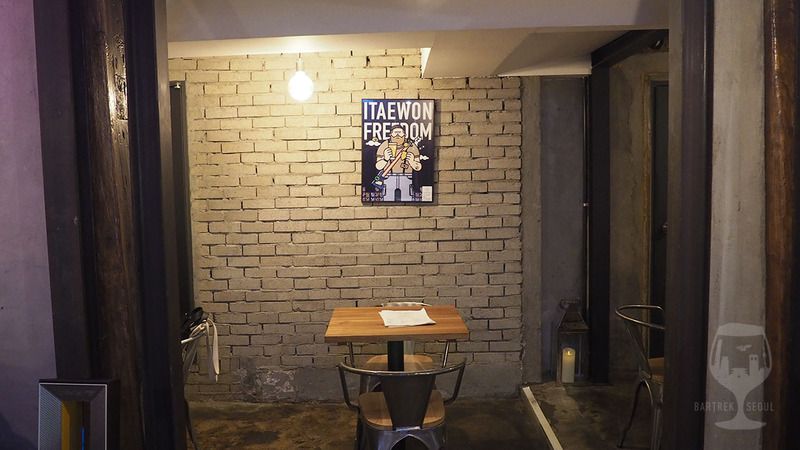 Like many places in the area, Art Monster is a renovated hanok, a traditional Korean house. This normally makes for a lot of smaller, partly secluded seating areas with some interesting open spaces. 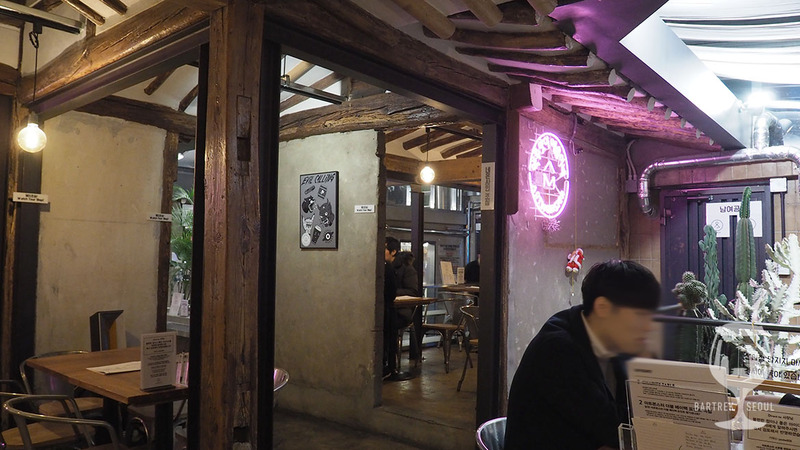 Art Monster is no different and has a little garden right in front of the counter. A shot through the greenery. Prices are very reasonable, especially for the big 1 liter take our cans. As mentioned, four beers were already sold out, but we got to taste the remaining six. 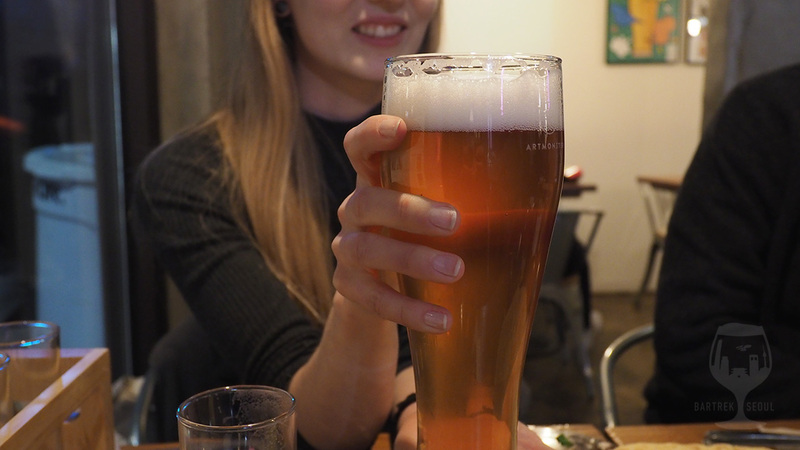 With styles like Belgian Wit, German Leipzig Gose and Grapefruit Session IPA you are in for something else than Seoul’s standard craft beer types. 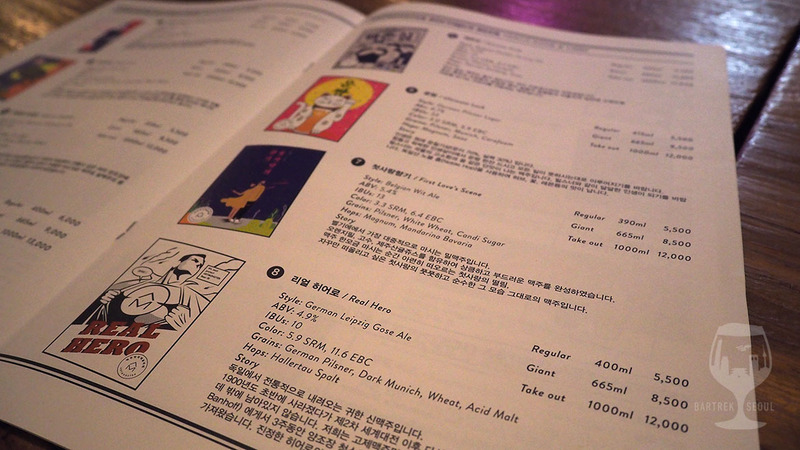 All the beers have distinct flavors, names and funky posters to add to the experience, and the hops and grains used for each beer are listed in the menu so the geeks can settle their arguments peacefully. While the general level was pleasantly high, but really the Grapefruit Session IPA was the night’s clear winner. I’m normally a bit sceptic to IPAs with fruit in their name, as they tend to be overly sweet, but this one was the bomb. Dry, hoppy, not too fruity, and with the relatively low alcohol content you can get the giant 660 ml serving without spoiling your appetite for more. 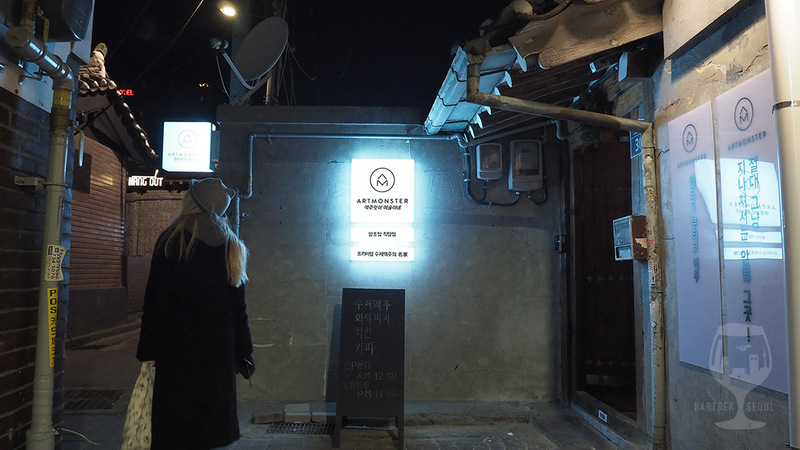 The counter is located in the middle of the hanok complex. 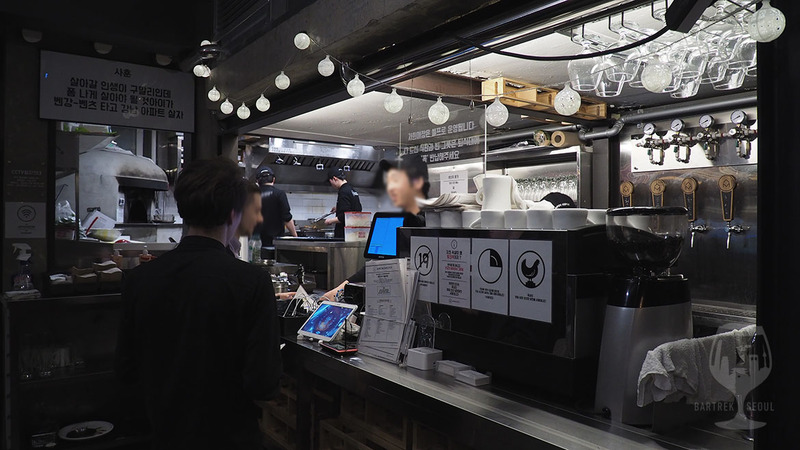 Order and pick up happens at the counter. Also they have front payment. Order and pick up at the counter. 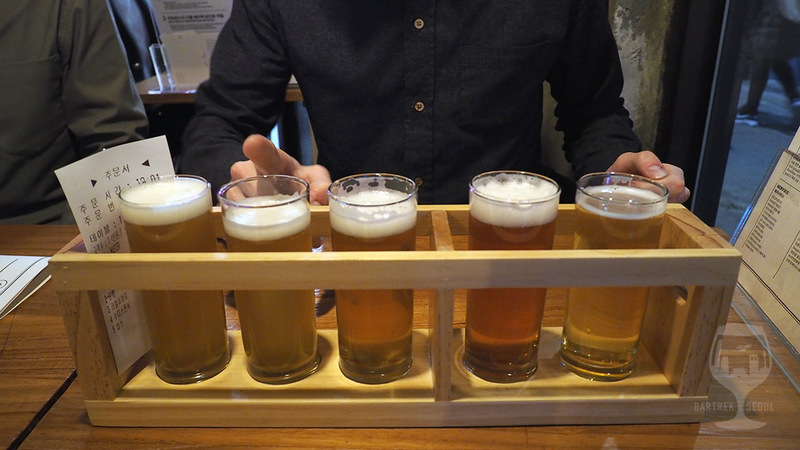 Sampler set with 5 different beers. 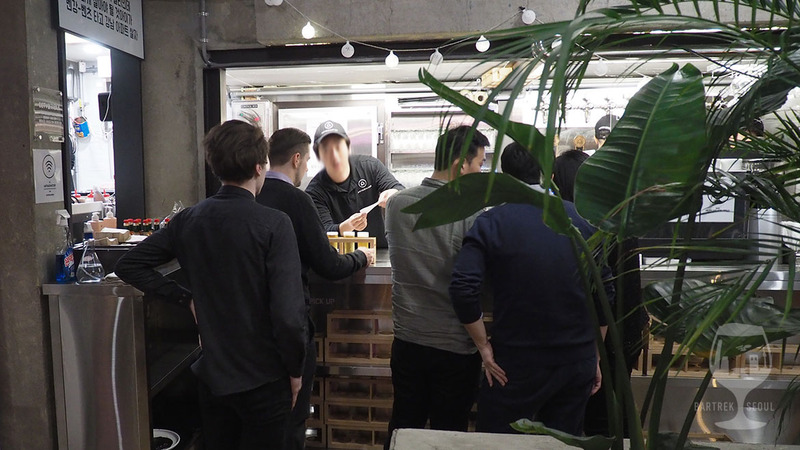 Four beers on the menu were sold out. Tasters are 220 ml and cost 16,000 won for a set of five. Another part of the pub. 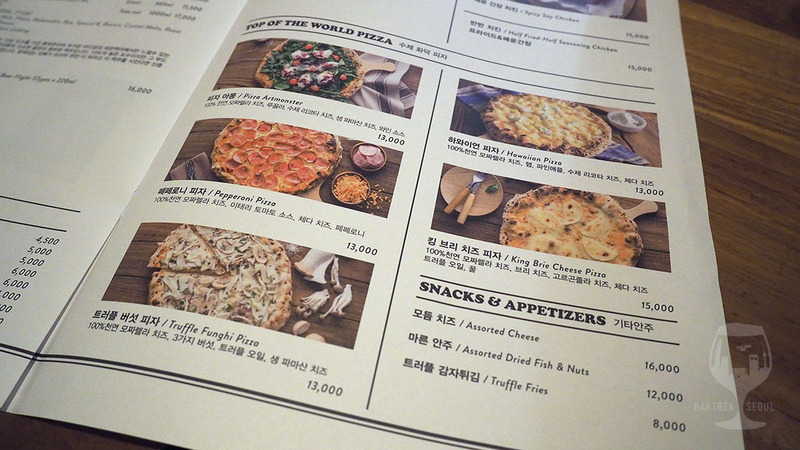 In addition to a great and rotating beer menu, Art Monster also has a fine-looking pizza selection. We got three pizzas (for four people), which made for a decent-sized dinner. 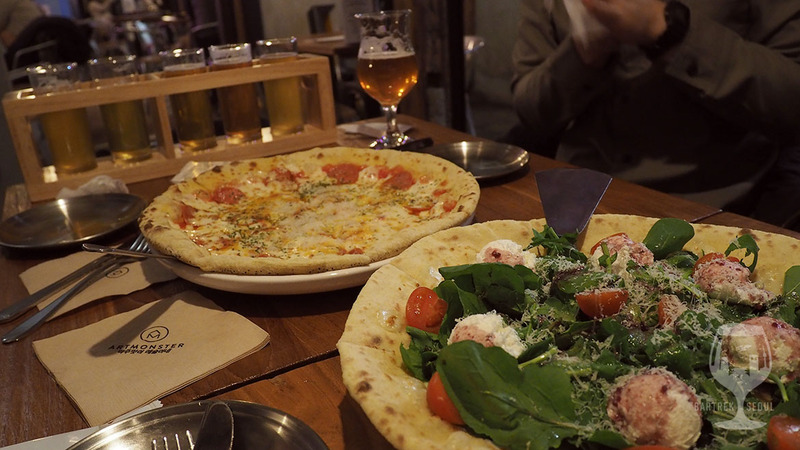 The pizza dough was delicious, although a tad soft, and the toppings were tasty and fresh. The King Brie cheese was very rich in flavor, as was the pepperoni, and their signature Pizza Artmonster was almost like eating a fresh salad with some bread and cream cheese. The venue was quite spacious and we had no problems getting a table, but was by no means empty. Guests were mostly younger people, but ages varied and I can imagine this place being busy on weekends. Music plays at a decent volume and was on point for most of the evening, the surprising highlights being some fresh 90s remixes. Their IPA was the best so we got another giant class of it. 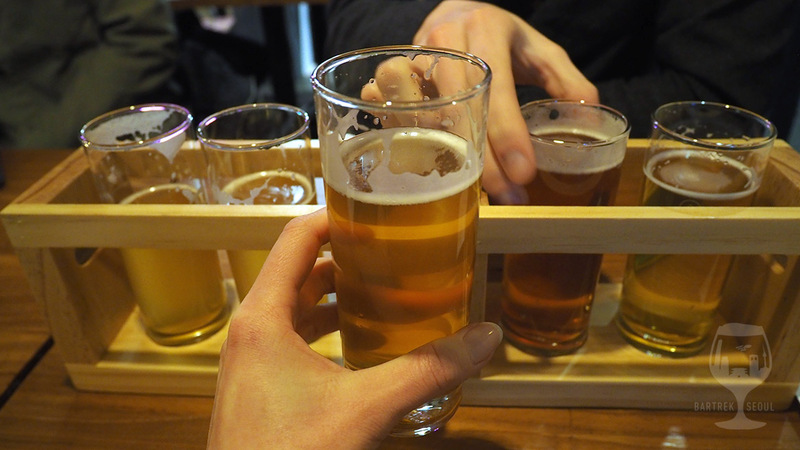 Beers come in many sizes, here you can see 220 ml tasters, a 400 ml regular and a 660 ml giant. Art Monster even offers a 1000 ml take out at very competitive prices. Zoom all the way in on your map to make it easier when navigating through the narrow alleys, and keep your eyes peeled for one of the signs showing the way to Art Monster.